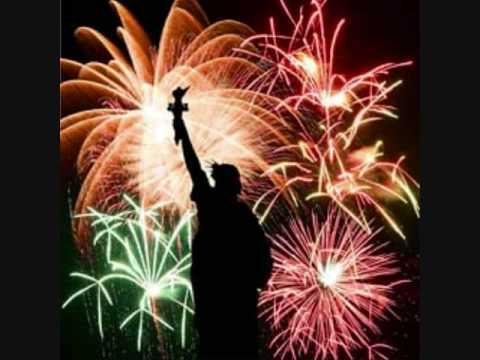 The Fourth of July commemorates the birth of the United States as a free and independent nation. I can’t imagine a more important right than freedom – whether for an individual, or a country. We’re not a perfect people, and we still struggle with issues of equal rights for all; but thankfully we live in a country where freedom of speech is protected by law, without fear of reprisal or oppression. Virginia was the first colony established in the new world, in 1607, so what better place to start? At first, this simple, unassuming image appears to simply record life in a quaint colonial town. Look again. 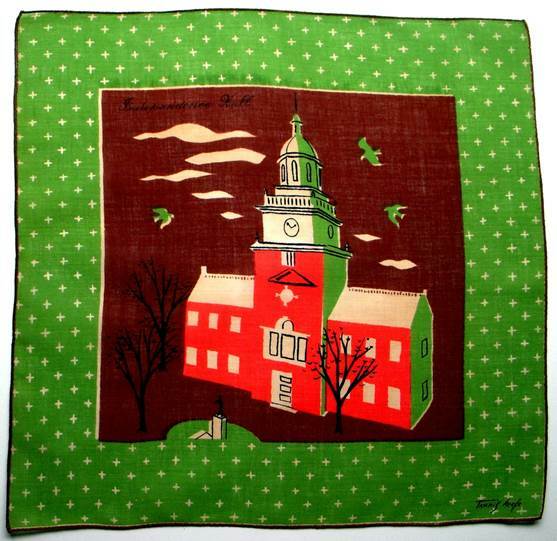 When you carry this hankie, you’re holding a powerful record of history in your hands. To enhance your viewing, click here for musical accompanyment while you read – America the Beautiful performed by 101 Strings Orchestra. The Governor’s Palace featured in the center of the hankie above served as the official residence for seven British governors. The stately Georgian manor stood on 63 acres, and included a stable, carriage house, kitchen, scullery, laundry, bathhouse and more, requiring 25 servants and slaves to tend. 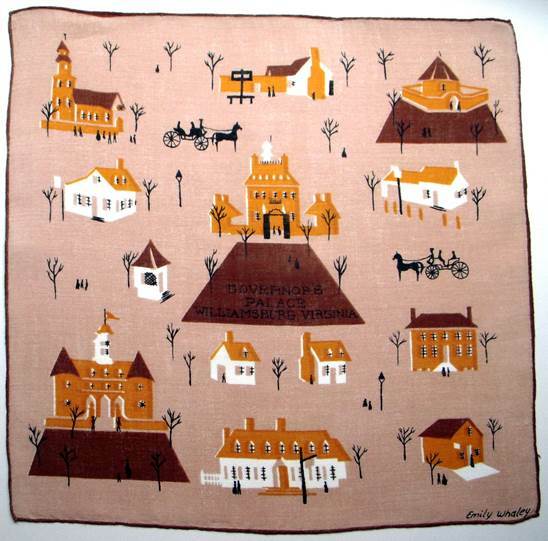 This hankie does not depict a quaint village, but rather a single residence, reflecting the power King George’s representatives wielded in the new world. 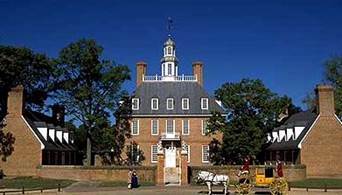 How satisfying it must have been, after the Revolutionary War, to see it become home to the first governors of the Virginia Commonwealth – Patrick Henry and Thomas Jefferson. Hip hip hooray! 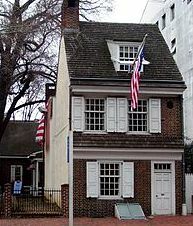 On May 15, 1776, from this building Virginia legislators instructed their delegation to Philadelphia’s Continental Congress to introduce a resolution to render the colonies independent from Great Britain. The Declaration came to represent a moral standard to uphold. Indeed, President Abraham Lincoln argued the Declaration was statement of principles through which the United States Constitution should be interpreted. Adopted by the Continental Congress on July 4, 1776, the thirteen colonies declared themselves free from British rule, forming a new nation – The United States of America. They met to ratify this important document in Independence Hall. Also from Independence Hall, on June 14, 1775, delegates from the Congress nominated George Washington as commander-in-chief of the Continental Army in the Assembly Room of this historic building. Ninety years later, The Assembly Room would house another historic event – the viewing of Abraham Lincoln’s body. Lincoln’s funeral train retraced the 1,654 mile route he traveled as president-elect in 1861. In Philadelphia, his coffin passed before a crowd of 85,000 mourners before being taken to lie in state where over 300,000 people passed through Independence Hall to pay their respects. 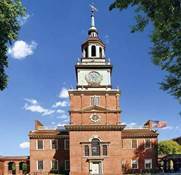 The massive bell originally resided in the steeple of Independence Hall and was used to call citizens and lawmakers to legislative session and public meetings. Cast in 1752 in London (remember, we were still under British sovereignty then), the bell may have been damaged on its voyage to America. No one knows for sure, but legend has it that the bell cracked the first time it was ever rung. There was no immediate announcement of the Second Continental Congress’s vote for independence on July 4, 1776, so it’s highly doubtful the bell was actually rung on that historic day. 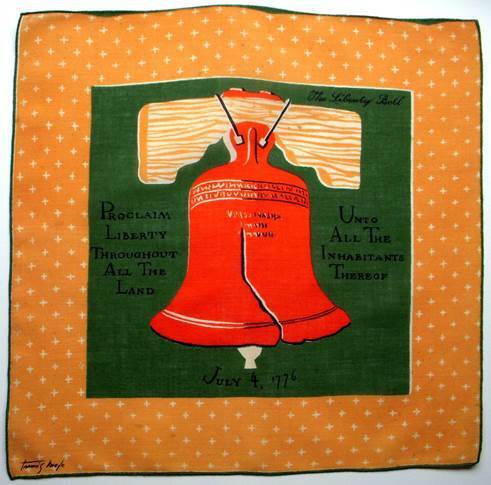 When the Declaration of Independence was publicly read on July 8, 1776, however, dozens of bells rang out, including, historians believe, the Liberty Bell. It wasn’t called the Liberty Bell until abolitionists adopted it as a symbol of freedom in the late 1830’s. Speaking of symbols, let’s not forget our glorious, beautiful flag. Elizabeth Griscom met and married John Ross when both were studying the craft of upholstery. Later widowed, Betsy continued their upholstery business, in addition to mending uniforms, and making tents and blankets for the Continental army. 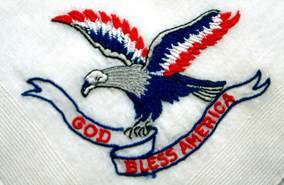 Legend has it a secret committee of the Congress asked Betsy to make the flag. Purportedly she suggested some changes, such as the shape of the stars, and not only made our first flag, but continued to create flags for the government for the next 50 years. (There have been twenty seven versions of the flag, with stars added as states entered the union, the most recent being Hawaii, added in 1960.) 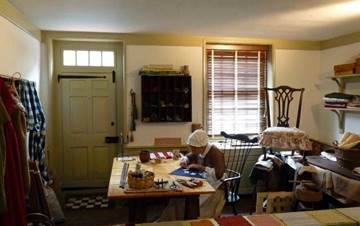 I remember visiting the Betsy Ross home as a child and being not only surprised at how tiny the house was, but how small the people were back then. I’ve included photos of the subjects, so you may compare and contrast them to Tammis Keefe’s renderings, which I think are just grand. She always manages to capture the essence of something with minimal detail. The Besty Ross hankie, for example needs nothing more than brillant red and sophisticated gray to render a striking image. 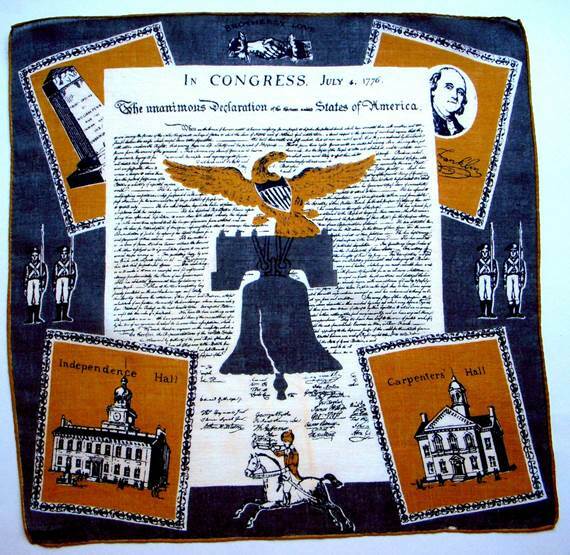 I love how how the Independence Hall, Liberty Bell and Betsy Ross hankies all contain a pattern of tiny stars in the border – subliminally underscoring a feeling of patriotism and pride. This plantation home on the banks of the Potomac River sits on land that had been owned by George Washington’s family since 1674. Constructed over 20 years, it remained Washington’s country home for his entire life. 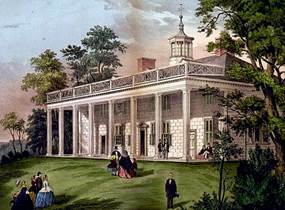 Following his death in 1799, the estate progressively declined, but in 1858, was saved from ruin by the Mount Vernon Ladies’ Association. It escaped damage that many plantations suffered during the Civil War. 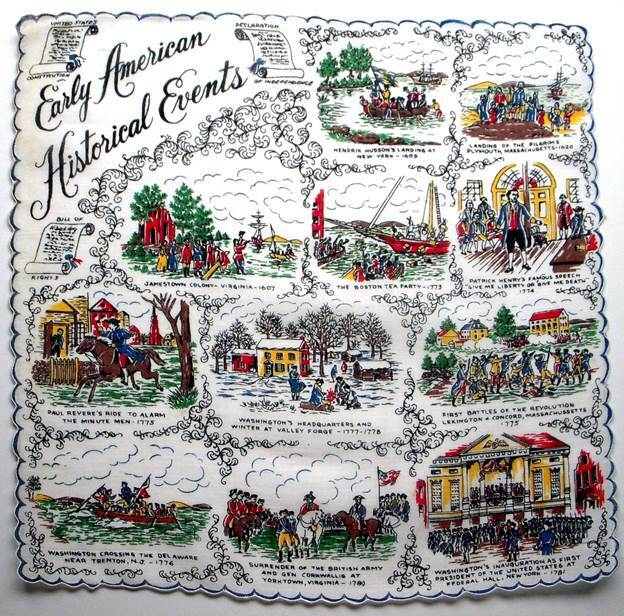 Long before ipads and iphones, handkerchiefs served as a portable venue for historical facts at your fingertips. Holy cow, here’s a fairly substantial cheat sheet for your next history exam! Everything from the Jamestown colony in 1607, to Plymouth Rock, to Patrick Henry, to Paul Revere, to Valley Forge, Crossing the Delaware, and even George Washington’s Inauguration are featured. 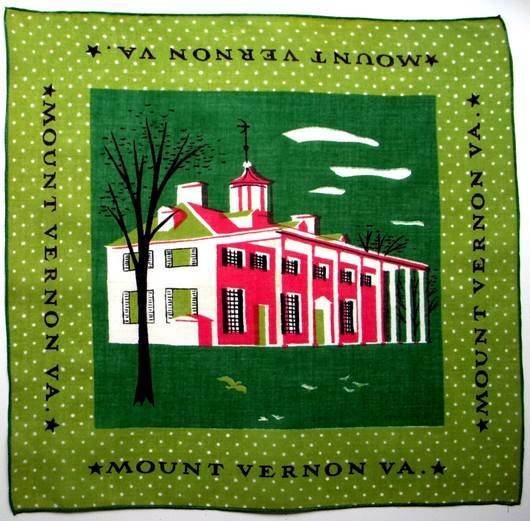 Speaking of which, legend has it the Martha Washington had political handkerchiefs printed for her husband’s campaign. 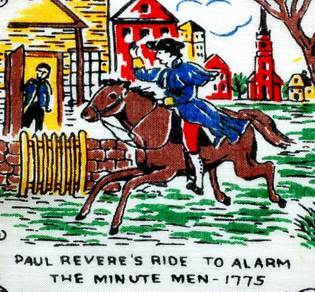 So there you have it – before we even had our first president, we had presidential handkerchiefs! Whether you chose to don red, white and blue or flutter one of these historic emissaries from your pocket, do pause for a moment of silence July 4th to honor those who fought for the freedom we so cherish today. For those of you lucky enough to either live near, or have the opportunity to visit these historic landmarks, I think you’ll agree they inspire a feeling of both pride and patriotism for our forefathers, for the challenges they met, and the ideals they upheld, some paying with their lives. 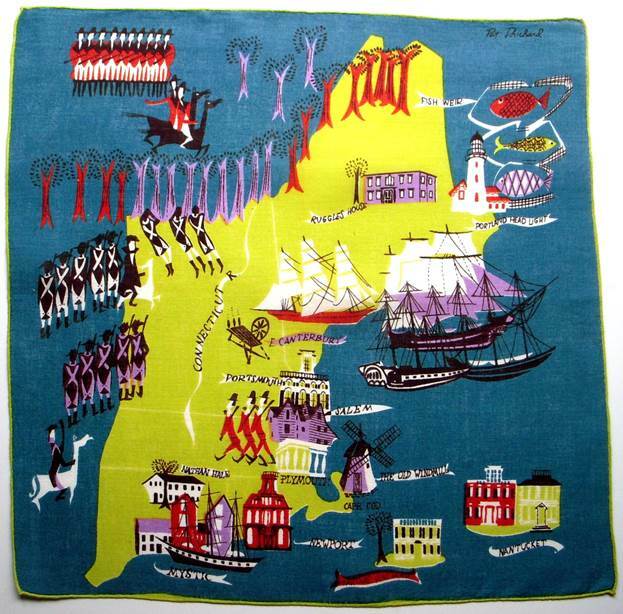 This final hankie which displays a partial map of Massachusetts has it all –redcoats hiding in the woods, a militia of minute men standing at attention, flourishing maritime, mercantile and fishing industries, bustling townships, lighthouses and windmills, and even a man riding a deer. (Don’t ask. I have no idea!) 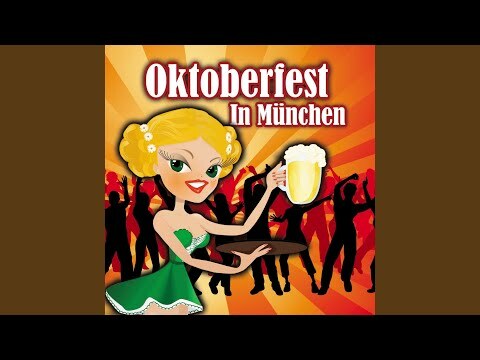 It’s colorful, fanciful and fun. Who wouldn’t want to carry this stunner on a historical holiday. I’m sure some reading this assumed a Fourth of July blog would be swathed in red, white, and blue. Indeed, there is nothing quite so satisfying as wearing those crisp, brilliant colors with pride on our nation’s birthday. Sometimes, however, stories take the road less traveled, and this one chose to plant its roots in colonial times, with the sights and smells of wood smoke and venison, cobblestones and carriage wheels, of billowing sails, taut lines, bustling seaports, and sawdust on the merchant’s floor. The hankies tell their own story; I’m merely the scribe. Lest you think I forgot, here’s a tip of the tricorn to our fabulous flag….